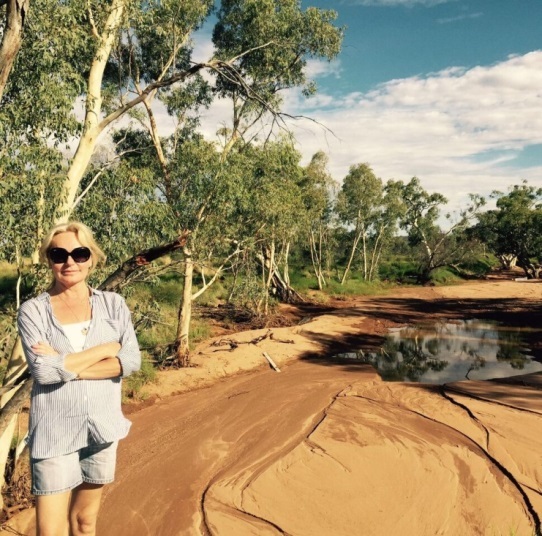 In The Pearl Sister, CeCe traces her family roots to a small settlement in the vast Red Centre of Australia: Hermannsburg Mission, near Alice Springs. There, she learns about its favourite son, Albert Namatjira, the most famous Australian Aboriginal artist of the 20th century. Exploring the Outback near Alice Springs in the January heat. 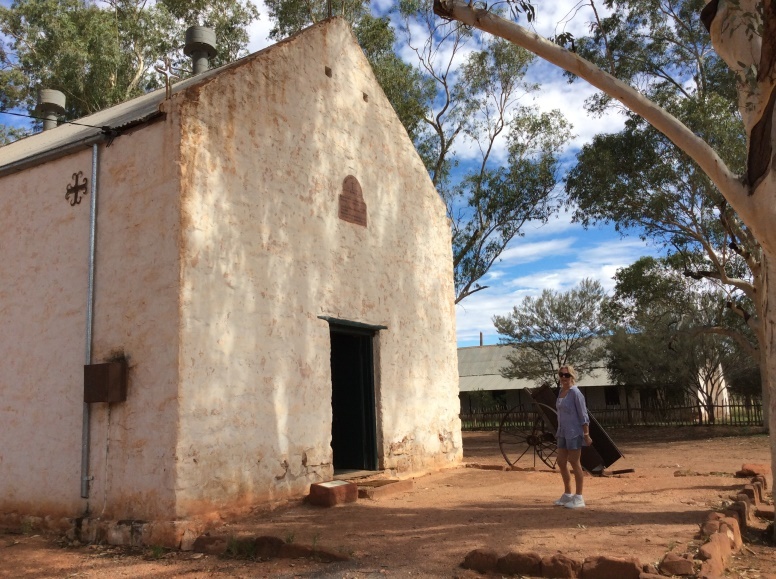 Hermannsburg was a Lutheran Mission founded in 1877 by pastors from Northern Germany but soon became an intercultural village embracing both European and Arrernte cultures. One of the early pastors, Carl Strehlow, who translated the Bible into the Arrernte language, had a son, Theodor (Ted) who in The Pearl Sister is a friend of the character Charlie. He became a famous anthropologist, bringing Arrernte culture to the attention of Australia. 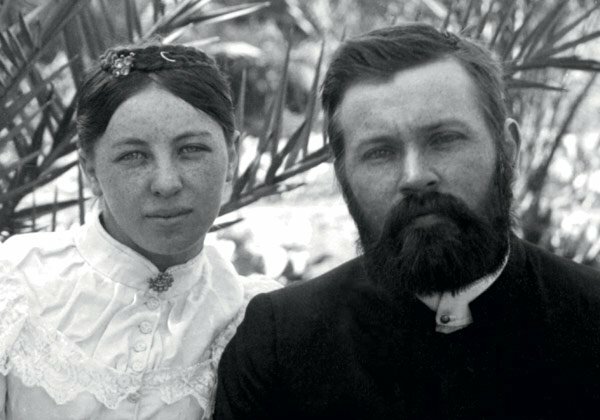 Pastor Carl Strehlow and his wife Frieda in the gardens at Hermannsburg in 1896. 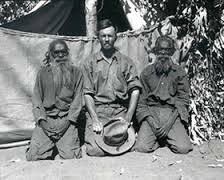 Ted Strehlow with two Arrernte elders. His book ‘Songs of Central Australia’ – now out of print and almost impossible to fine – is one of the most complete records of Arrernte oral traditions. 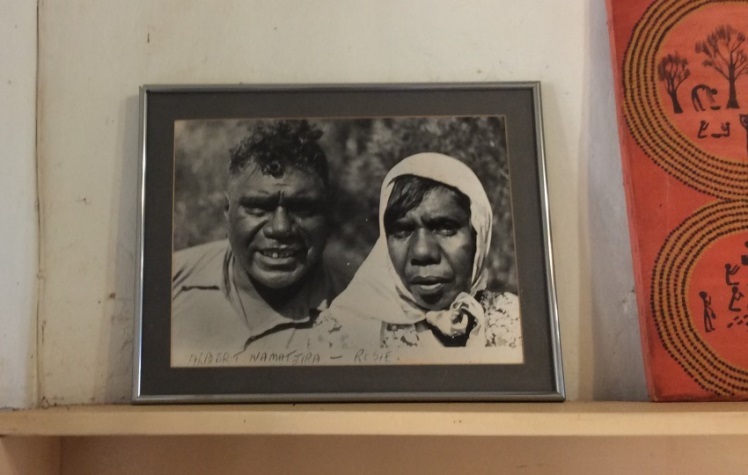 Pastor Albrecht took over at Hermannsburg Mission in 1922 and along with Ted Strehlow, supported Albert Namatjira and his fellow Aboriginal artists, and fought for the establishment of more Aboriginal settlements. 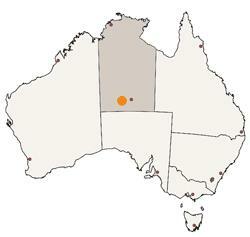 Albert Namatjira was born at Hermannsburg in 1902. Even though he was christened, he maintained his Arrernte spiritual beliefs and often went “walkabout” in the outback with his relatives, disappearing for weeks at a time. 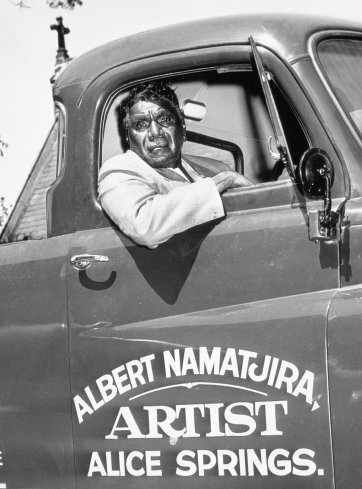 Albert Namatjira in his pick-up truck. Picture by Ern McQuillan. When he was seventeen, he eloped with the daughter of a different ‘skin’ group and married her, producing seven surviving children together. His wife was eventually christened and was given the name ‘Rubina’. 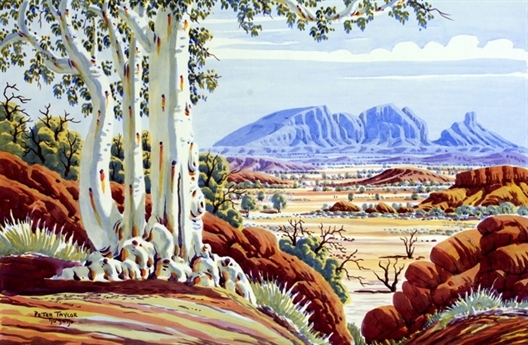 In 1934, the watercolourist Rex Battarbee visited the Mission and exhibited his paintings of the MacDonnell ranges. Fascinated, Albert asked to learn from him, and Rex took him under his wing. Albert’s talent soon blossomed, and he had his first solo exhibition in December 1938. Albert’s watercolours stunned and confounded the Australian art world. Critics could not understand why an Aboriginal artist was painting in such a ‘European’ style, and not using traditional dot painting. 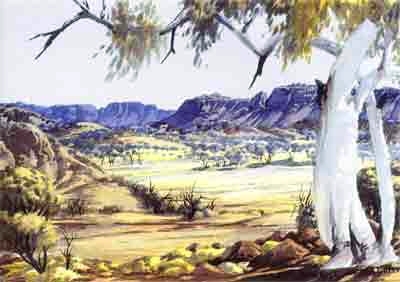 Two of Albert’s watercolours of the landscape surrounding Hermannsburg, with one of the famous ghost gum trees in the foreground. Albert inspired other young Aboriginal artists to paint and subsequently founded the Hermannsburg School. His fame spread and in 1954 he was presented to Queen Elizabeth and the Duke of Edinburgh in Canberra – it is said he woke up early that day to practice his bow for several hours. In 1957, he and Rubina were the first Aboriginal people to be granted full citizenship rights – rights which were denied to all other Aboriginal people, including their own children, for another decade. However, Albert’s life came to a tragic end. For years, he had been plagued by heart problems, and had struggled with his drinking. In 1958, he was arrested and sentenced to six months’ hard labour for giving rum to a fellow tribesman (which was illegal under Australian law at the time). He was imprisoned and lost his desire to paint, sinking into deep depression. He died shortly afterwards. Albert left behind an incredible body of work, and to this day many of his descendants are artists in their own right. Hermannsburg village is now a National Trust Historic Precinct, and anyone can visit the beautiful preserved buildings, just as I did when I was researching CeCe’s story. 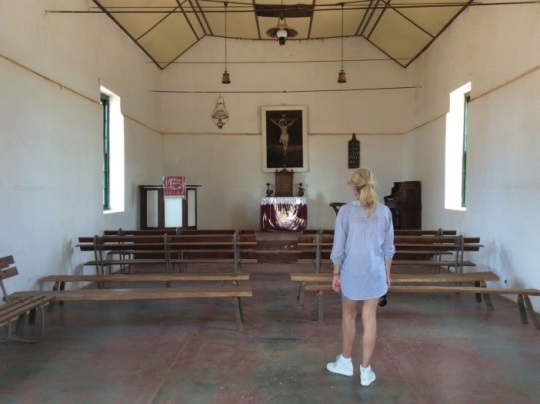 Inside and outside the chapel at Hermannsburg where ‘Mister D’ takes Kitty in ‘The Pearl Sister’.